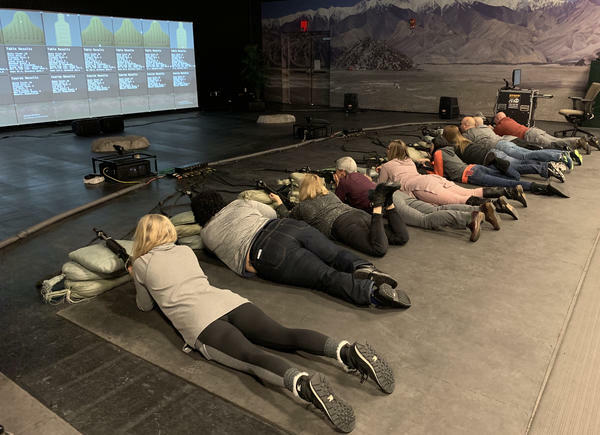 High school educators take part in a virtual firing range exercise as they tour Fort Carson, Col. Army leaders hope these tours will result in educators steering more students toward military service. Dan Boyce joins high school teachers and administrators on a tour of Fort Carson, Col. 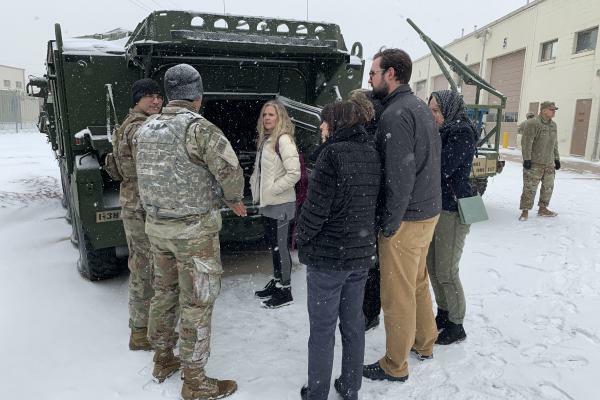 Supervised by soldiers in their full battle gear, about 20 high school educators huddled together at Fort Carson, the sprawling Army base outside Colorado Springs. It was cold, windy, and snowing, but the teachers, counselors, and administrators forged ahead with a day-long tour of the base. 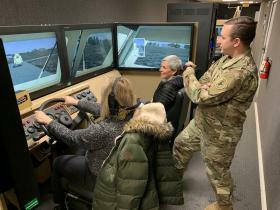 Recruiters showed them everything from a fleet of military vehicles to a video game-inspired simulation of what it's like to drive those vehicles. They visited a gym and shopping center and tested their aim on a virtual shooting range. The Army hopes tours like this one can persuade educators that the military is a smart professional and academic choice for their career-driven students. The Army fell 6,500 soldiers short of national recruitment goals set last year by the Trump Administration. It was the first time the Army didn't meet its recruitment goal in more than a decade. The battalion responsible for recruitment in Colorado, Nebraska, and Southern Wyoming is charged with bringing in 2,300 new soldiers in 2019 as part of a new nationwide recruitment drive. Army captain and recruiter Wes Barber said that back in the day, the military's recruitment strategy used to focus on bravery and the thrill inherent in military life. "There are still folks out there that want that," he said. "There are still folks out there that just want to serve their country." But Barber said to reach the Pentagon's higher recruitment goals, the Army nowadays has to appeal to more than a young person's sense of adventure and patriotism. "I would conjecture that when you join the military, you are in fact choosing college," said Army Education Services Spec. Larry Beer as he spoke to the group in a gymnasium where an enormous American flag took up much of the wall behind them. The Army can be part of a serious collegiate plan right from the start, Beer said, and recruits can earn college credit even through basic training. He told the teachers there are more than 150 career options in the Army, representing information technology and medical fields, human resources, logistics, and more. The Army is also using social media campaigns and fielding teams in video game tournaments to convey the same message to young people. Las Animas, Col. high school English teacher David Armstrong said the tour broadened his perspective of what the military can offer potential recruits. "You know, when I was in high school...it was a lot of the 'give me a gun and we'll go out and do what we got to do and then come home and then it's the GI bill,'" Armstrong said. "But their job is not just to carry a gun and a 50 pound backpack and go shoot people. It's in some cases being an operating room specialist." All the educators volunteered to come on the tour and they generally came away with a positive impression of the options in the Army. Kate Bridgman, who teaches English language development at Cheyenne Mountain High School in Colorado Springs, had never been on Fort Carson, even though she lived and worked near the base for years. Many of her students are green card holders considering the military as a path to citizenship. "As an educator, I need to look at all avenues for my kids - what they're ready for, what they're looking for," Bridgman said. "The military has certainly developed a much more diverse kind of approach." The tour ended with the visit to the virtual firing range, where the educators lay on their stomachs and shot imitation AR-15s toward targets projected on a huge screen - a reminder that while serving in today's Army means more than shooting weapons, shooting is definitely still part of it.